As you can see, this kind of ‘resilience’ research is not really telling us anything more than we used to learn from studies of risk factors. So, can resilience research tell us anything new? If we research resilience in this way, it becomes less important whether we use the term ‘high social support’ or ‘loneliness’. What is important is that our social relationships can influence how we will deal with stress. We can say that better social relationships can buffer or attenuate the likelihood that stress will lead to poor well-being, or that poorer social relationships harm our capacity for resilience and will make us more vulnerable to poor well-being in response to stress. To provide researchers with a guide for doing this kind of research, and to clarify the criteria that a variable should meet in order to be considered as conferring resilience, I have gathered these ideas together in a framework called The Bi-Dimensional Framework (BDF) for resilience research. It overcomes the confusion caused by the range of terms that have been used to describe ‘resilience’. There have been a lot of words used in the research literature to describe resilience, these include ‘mental toughness’, ‘hardiness’ and ‘psychological resilience’, among others. As you could probably tell, this can be confusing. However, the BDF defines resilience according to methodological criteria (i.e., what a variables does, or how it behaves), rather than terminology. It means we can use research to develop increasingly accurate concepts of resilience. In the past it has been common practice to propose a concept of resilience, create a questionnaire to measure this, and then test it in relation to negative outcomes. If it is linked with lower levels of negative outcomes, the researchers conclude that the variable confers resilience. If it doesn’t, the researchers conclude that resilience doesn’t confer resilience in this instance. As outlined above, this doesn’t tell us whether the variable does indeed buffer the impact of stress. 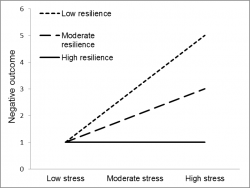 However, even more confusingly, how can a ‘resilience factor’ not confer resilience? If this concept doesn’t confer resilience, then by the very definition of resilience we must conclude that it is not in fact resilience at all. Instead, we could surmise that there are other factors which confer resilience, which are not related to this concept. This points to a need for concepts of resilience which can be developed and adapted in response to research. As a framework for resilience research, the BDF allows for this kind of growth and development. In particular, it enables the systematic review of individual studies which have investigated factors which buffer the relationship between stress exposure and negative outcomes. Together with my collaborators, I have conducted systematic reviews of resilience factors using the BDF approach, both of which have been published in a leading psychology journal. The first of these investigated psychological variables which buffer the relationship between exposure to any risk factor and suicidal thoughts. This suggested that hope, flexible thinking, self-confidence and a good way of looking at events conferred resilience. The second investigated psychological variables which buffer the relationship between exposure to failure experiences and psychological distress. This found that mental flexibility, higher self-esteem and a positive way of explaining events confer resilience to distress in response to failure. Together, these reviews suggests that even if you look at different kinds of negative outcomes, similar variables seem to confer resilience. These variables relate to mental flexibility, self confidence and self-esteem, and a positive way of positive way of explaining events. Hope, flexible thinking, self-confidence and a good way of looking at events can confer resilience. Yes, we think so. The factors identified by these reviews (mental flexibility, self-esteem and self confidence and explanatory style) are those which are commonly targeted in cognitive-behaviour therapy, which is an evidence-based form of psychological therapy. CBT was initially developed as an intervention for people with mental health problems, but has since been found to be effective for improving mental well-being in a range of populations. With a collaborator in Australia, Dr Reema Harrison, I have been developing an intervention plan for training medical students in resilience which draws on CBT. This intervention is designed to train participants in resilience through three 60-minute workshops based on the principles of cognitive-behaviour therapy. These workshops will involve psychoeducation, experiential exercises and group work. Dr Judith Johnson is a clinical psychologist who is based at both the Institute of Psychological Sciences of the University of Leeds, and the Bradford Institute of Health Research.